EAA Vintage Aircraft Association > News > VAA News > REPLACING YOUR OLD FLAT SCREEN TV? REPLACING YOUR OLD FLAT SCREEN TV? Many people are replacing HD flat screen TVs with newer 4K models. 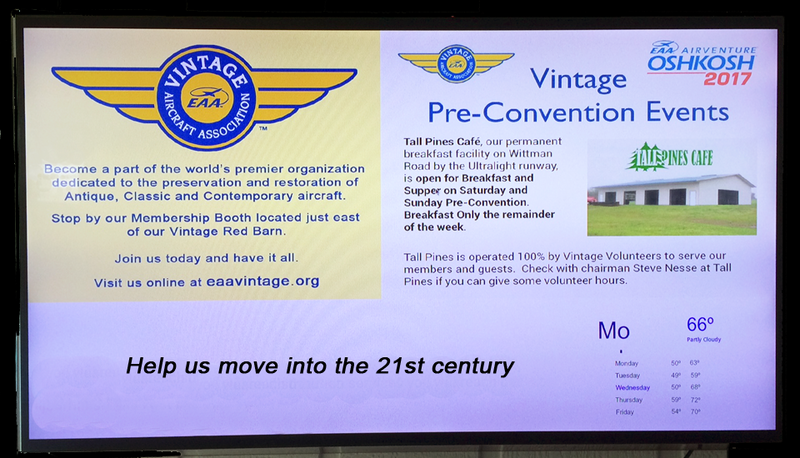 Vintage is moving into the digital age for AirVenture and can make good use of your old HD flat screen TV. Rather than printing thousands of Daily Events Schedules and other information, we hope to have digital monitors strategically located through our two-mile AirVenture area. Our primary information sites will be in the Red Barn at Rose Plaza and in Tall Pines Cafe. We are looking for TVs 32″ or larger. Onlly requirement is that they work and have an HDMI connection. The more TVs we get, the more places we can display this important information. Contact Hannah at 920-426-6110 if you can help out.